A report should be written for a specific reader or readers: the marketing managers who will use the results. The report should take into account the readers’ technical sophistication and interest in the project, as well as the circumstances under which they will read the report and,how they will use it. Technical jargon should be avoided. As expressed by one expert, “The readers of your reports are busy people; and very few of them can balance a research report, a cup of coffee, and a dictionary at one time.”” Instead of technical terms such as maximum likelihood, heterosexuality. and non parametric, use descriptive explanations. If some technical terms cannot be avoided, briefly define them in an appendix. When it comes to marketing research, people would rather live with a problem they cannot solve than accept a solution they cannot understand. Statistical tables are a vital part of the report and deserve special attention. 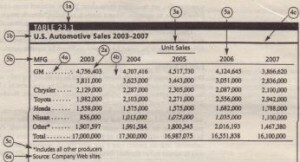 We illustrate the guidelines for tables using the data for U.S. automobile sales reported in Table 23.1. The numbers in parentheses in the following sections refer to the numbered sections of the table. The arrangement of data items in a table should emphasize the most significant aspect of the data. If the data contained in the table are secondary, the of data should be cited (6a). Geographic and other maps, such as product-positioning maps, can communicate relative location and other comparative information. Geographic maps can pertain to countries, states, counties, sales territories, and other divisions. For example, suppose the researcher wanted to present information on the relative number of Coca-Cola Company bottlers versus the bottlers for PepsiCo and other . competitors for each state in the United States. This information could be effectively communicated in a map in which each state was divided into three areas, proportionate to the number of Coca-Cola, PepsiCo, and other bottlers, with each area in a different color. 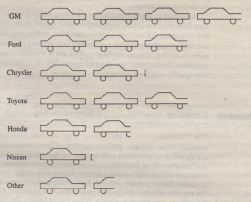 Chapter 21 showed examples of product-positioning maps derived by using MDS procedures (e.g., Figure 21.4). 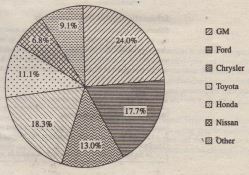 In a pie chart, the area of each section, as a percentage of the total area of the circle, reflects the percentage associated with the value of a specific variable. 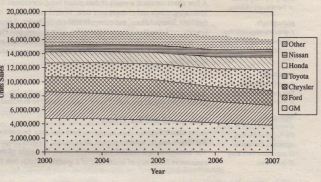 A pie chart is not useful for displaying relationships over time or relationships among several variables. As a general guideline, a pie chart should not require more than seven sections.s Figure 23.2 shows a pie chart for U.S. automobile sales. A bar chart displays data in various bars that may be positioned horizontally or vertically. 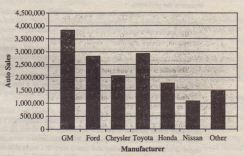 Bar charts can be used to present absolute and relative magnitudes, differences, and change. The histogram is a vertical bar chart in which the height of the bars represents the relative or cumulative frequency of occurrence of a specific: variable (see Figure 23;6). There are a number of advantages to publishing marketing research reports on the Web. These reports can incorporate all kinds of multimedia presentations, including graphs, pictures, animation, audio, and full-motion video. The dissemination is immediate and th,e reports can be accessed by authorized persons online on a worldwide basis. These reports can M electronically searched to identify materials of specific interest. For example, a General Electric manager in Kuala Lumpur can electronically locate the portions of the report that pertain to Southeast Asia. Storage and future retrieval is efficient and effortless. It is easy to integrate these reports into the decision support system. Tomohiko Ikeda, chairman, president, and CEO of Subaru of America, Inc, knows that customer loyalty is a big part of the automotive industry today, and Subaru has long been aware of this fact. 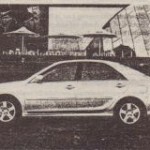 Subaru, in the past, relied heavily on the traditional, paper-based customer response surveys. Short, follow-up purchase experience surveys and service experience surveys were mailed to customers within 7 to 14 days after purchase. These surveys entailed both multiple-choice questions and open-ended questions. The response rates from the mailings ranged from 30 to 45 percent. After all the data were collected from the mailings, dealerships received a Subaru Owner Loyalty Indicator (SOLI) rating quarterly report. To address this situation, the answer for Tomohilco Ikeda was the Internet, which would jlrovide faster, more flexible service and information to dealers, field staff, and the management team. Subaru hired Data Recognition Corporation (DRC) of Minneapolis, Minnesota, to set up the program design and provide the ongoing service. The procesa begins by scanning the responses from customer survey forms using optical character recognition. Customer comments are captured and categorized. Next, all survey information is electronically added to the appropriate dealer’s database using a customized program developed by DRC. dealerships. They can access up-to-the-minute reports on a specified dealership before meeting with the dealer. This works well because the managers are able to access this information from anywhere as long as they can tap into the Internet. 1. While Subaru management finds the report very useful, the dealers have a slightly different opinion. How should the report be modified to improve its usefulness to the dealers? 2. Discuss the role of the type of report YOIl recommend in enabling Tomohiko Ikeda to make the dealer sales effort more effective. 1. What should Tornohiko Ikeda do to make the dealer sales effort more effective? The key to an effective presentation is preparation. A written script or detailed outline should be prepared following the format of the written report. The presentation mUM be geared to the audience. 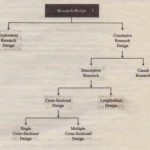 For this purpose the researcher should determine their backgrounds, interests, and involvement in the project, as well as the extent to which they are likely to be affected by it. The presentation should be rehearsed several times before it is made to the management.